Let’s all breathe a collect sigh of relief that 2016 is over. Although, this year wasn’t so terrible for me personally, I know that it was pretty rough for many others. Health scares, miscarriages, terrorist attacks, school stabbings, the fentanyl epidemic, record breaking rain, devastating natural disasters, skyrocketing real estate, the ongoing crisis in Syria, a relentless string of celebrity deaths, and an election season that sucked the life out of everyone. I think I speak for us all when I say, 2016 – good riddance. But, all that being said, there is still so much of the past 12 months to be grateful for. I made so many new friends and was able to both visit and host friends from far away. It was a transition year for me professionally as I started a fantastic new job in February. As my priorities shifted to spending more time focused on work, this in turn caused a slight dip in my world travels. However, I still managed to maximize weekend getaways and finally hit my milestone 30th country. As I look back on 2016, I want to remember the good and carry forward a message of hope. There’s still a lot of love and light in the world and nothing teaches that better than travel. So with that being said, here is a look back on my travel adventures during the past 365 days. I successfully continued my streak of celebrating the new year in a different city for the 3rd year in a row. After a night of feting and fireworks at the Experience Music Project, we began 2016 by exploring Seattle’s Underground City and the Chihuly Garden and Glass Museum. We lucked out with bright blue skies and although I’ve been to Seattle more times than I can remember, this visit was probably my favourite. There are few things that I cherish more than my annual trip to San Diego. It is one of my top 10 favourite cities and home to my dear friend Jennie. This trip was extra special as I got to meet her daughter Maggie for the first time. Baby in tow we visited old favourites like La Jolla and Pacific Beach and finally got around to visiting Balboa Park. As I mentioned, I started a new job in February (woo!) and gave myself a week break in between (something I highly recommend). This was the perfect opportunity to tag along with my travel buddy Mindy on a couple of hotel site-visits in our provincial capital. We split our two nights between the Fairmont Empress and the Delta Grand. I got a horrible cold on the way over and it poured rain almost the entire time. But fortunately, I had a great friend and a lovely city to cheer me up. I took off for my first business trip with my new job after merely 10 days. With just a 20 minute Harbour Air flight I was in Nanaimo, a commute that would become familiar as I made three additional trips in 2016. I haven’t got the chance to fully explore the area as a tourist but I do love any time I can get on the island. And, I’m a sucker for a seaplane ride, especially when I get to sit up front with the pilot! For Easter weekend, my extended family descended upon Calgary for my cousin Jordan’s wedding. Essentially everybody attending was from out of province, which made it a family reunion of sorts. The wedding itself was at an incredibly picturesque spot in the foothills and it was great to catch up with all my relatives. The trip highlight was definitely when a pack of my cousins and I hit up Mt. Norquay in Banff for a day of skiing. I was thrilled to be back on the slopes after a five year hiatus (how did that happen?) and relieved to know that I hadn’t forgotten how to ski. Our third annual girls getaway was yet another huge success. This year we went to nearby Bowen Island, which is quite possibly the easiest and most relaxing city escape for Vancouverites. Just a short half hour ferry ride landed us on a beautiful little island in a quaint cottage with lakes and hiking at our door step. We once again lucked into perfect spring weather and spent most of our time drinking wine and catching up with Rachel, freshly back from 9 months in Quebec. Four years post-university and we’re still going strong. This year I decided to see more of my home country. That may have had something to do with the exchange rate, but mostly because Canada is amazing. On the top of my list was Montreal, where I wouldn’t have to break out my grade school French but could still get a major dose of culture. I met up with my friend Katie, who recently moved to Ontario, and checked ourselves into an adorable apartment near Le Plateau. The summer temperatures and festival atmosphere made for a super fun weekend. We ate poutine and bagels and watched Cirque de Soleil and rode bikes through the Old Town at night. It was a great intro to Quebec and I look forward to exploring more of the province in the future. This year’s annual camping trip occurred over the Canada Day long weekend at a super secret camp ground in the states. Thanks to my expert camper friends we enjoyed a quiet weekend floating on a mostly deserted lake with warm but not hot weather. Basically just eating and playing board games and sitting around a camp fire. We also may or may not have decorated our tents with Canadian flags and paraded through the campground with face tattoos. Yup – we are those people. 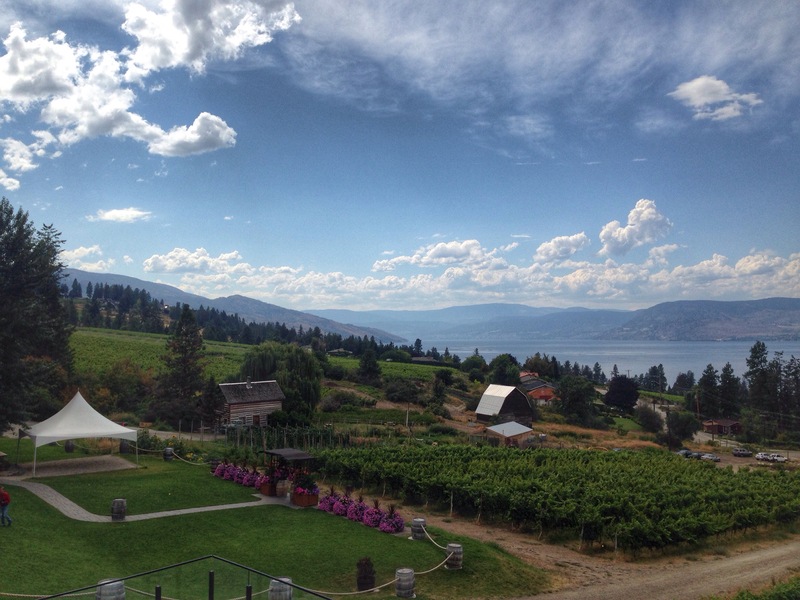 One of my favourite summer traditions is heading to Kelowna with all my extended family. I have several Aunt’s and Uncle’s who have places on the Lake and between them we have two boats. So this past August I spent 2 days wakeboarding and wine tasting with my pack of 20 something cousins. It was fantastic! I’m continually thankful for a family that I actually really like to hang out with. I cannot for the life of me figure out why Chicago doesn’t get more buzz. It’s such a fantastic city. Great food and entertainment in a gorgeous setting on Lake Michigan. My first trip to the windy city was with my perennial travel buddy Mindy. We took a red eye flight and made the most of the Labour Day long weekend. We crammed in everything from deep dish pizza to the famed architecture boat tour to comedy at Second City. If it wasn’t for the winters, I could totally see myself living in Chi-town one day. After nearly nine years, I finally made it back to New York City. This time in early autumn, which I think is probably the most perfect time to visit the Big Apple. Once again accompanied by Mindy, we conquered a giant portion of our NYC bucket list. My most memorable activities were visiting the 9/11 Museum and attending the off-broadway show Sleep No More. Seriously, you must experience this show! But what surprised me the most was how overwhelmed I felt by the crowds. I’m a total city girl and usually love the hustle and bustle, but NYC took it out of me. I found myself craving nature and some quiet time in the park. I guess that’s why Vancouver is the perfect city for me. Taiwan was an unexpected surprise stopover on route to Thailand. We had a full day to explore, which was made even easier by the free half-day tours offered at the Taipei airport. We visited a temple, and made pastries, and attempted to chat with the locals. It was such a low stress way to kick start our vacation. My 30th country! I was so deliriously happy to be on vacation in a warm, tropical destination. It was made even better by the fact that my sister-in-law tagged along to help me enjoy all the affordable luxuries available in Southeast Asia. Cheap massages and tailors and beer, oh my! I was slightly concerned about visiting Thailand in the wake of their beloved king’s death, but even in mourning, the Thai people blew me away with their kindness and generosity. I know this won’t be my last trip to the Land of Smiles. Another annual tradition is forming, where I make the 5 hour drive down the I-5 to visit my cousins in Portland. My only goals for this particular trip were beer and brunch, both easily accomplished within hours of my arrival. Fortunately, the weather gods smiled upon us and we were able to spend the entire day on Sunday adventuring in the Columbia River Gorge, one of the Seven Wonders of Oregon. We stopped for a panorama view at Vista House and at the famous Multnomah Falls for a photo-op and then hiked to Wahclella Falls (pictured above) nearly in solitude. We even had time to drive over the Bridge of the Gods into Washington to stop at the Panther Creek Falls (yes, more waterfalls!) before we ran out of daylight (take that TLC). It’s no wonder that US Congress recognized this area as the largest National Scenic area in America. My final getaway of 2016 was to the stunning Sparkling Hill Resort & Spa in Vernon, BC. My family Christmas celebrations got moved earlier in the month so I was free to grab my girl Erica for a spa getaway that has ruined me for all future spas. The sprawling hotel is perched on a hill overlooking Lake Okanagan and lavished with Swarovski crystal decor. It was luxurious and relaxing and definitely worth the slightly harrowing drive up the Coquihalla highway. Plane Rides Taken: 15 one way flights (I count a flight as a flight regardless of how many segments or layovers it has). Other Modes of Transportation: 8 ferries, 2 buses, and more vehicles than I care to count. Beds Slept In: 21. Of those, 11 were hotels, 5 were crashing with family or friends, 3 were Airbnb rentals, one was a tent, and one was my own bed! What are your favourite travel memories of 2016? This entry was posted in Musings and tagged Adventure, Blog, Travel, Wanderlust. Bookmark the permalink. WOW! Good for you Whitney! Looks like another great travel year! Where did you stay on Bowen aisland? Any other recommendations for the island? And I’m seriously digging camping in the national park in Washington… I may need to check out that spot! Happy travels in 2017! !